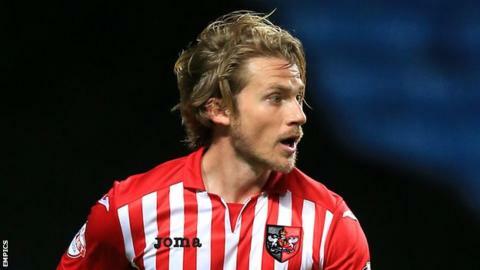 Exeter sealed all three points against Hartlepool United thanks to Christian Ribeiro's dramatic injury-time winner. David Wheeler found the back of the net for the Grecians but it was disallowed after Tom Nichols was judged offside. The visitors could have taken the lead after Jordan Tillson fouled Rhys Oates but Rakish Bingham saw his penalty saved by Bobby Olejnik. And Ribeiro made Hartlepool pay late on when he unleashed a shot from a tight angle to seal the win. Match ends, Exeter City 1, Hartlepool United 0. Second Half ends, Exeter City 1, Hartlepool United 0. Corner, Hartlepool United. Conceded by Jordan Tillson. Corner, Hartlepool United. Conceded by Troy Brown. Goal! Exeter City 1, Hartlepool United 0. Christian Ribeiro (Exeter City) right footed shot from the centre of the box to the bottom right corner. Assisted by Clinton Morrison. Corner, Exeter City. Conceded by Dan Jones. Corner, Hartlepool United. Conceded by David Noble. Attempt blocked. Michael Woods (Hartlepool United) right footed shot from a difficult angle and long range on the right is blocked. Attempt saved. Jamie McAllister (Exeter City) header from the centre of the box is saved in the bottom left corner. Substitution, Hartlepool United. Scott Fenwick replaces Rakish Bingham because of an injury. Substitution, Exeter City. Joel Grant replaces Matt Oakley. Corner, Hartlepool United. Conceded by David Wheeler. Attempt blocked. Dan Jones (Hartlepool United) right footed shot from the centre of the box is blocked. Attempt saved. David Wheeler (Exeter City) right footed shot from the centre of the box is saved in the centre of the goal. Attempt saved. Lee Holmes (Exeter City) left footed shot from outside the box is saved in the centre of the goal. Penalty saved! Rakish Bingham (Hartlepool United) fails to capitalise on this great opportunity, right footed shot saved in the bottom left corner. Penalty Hartlepool United. Rhys Oates draws a foul in the penalty area. Penalty conceded by Jamie McAllister (Exeter City) after a foul in the penalty area. Substitution, Exeter City. Lee Holmes replaces Alex Nicholls. Attempt missed. Christian Ribeiro (Exeter City) header from the centre of the box misses to the left following a corner. Corner, Exeter City. Conceded by Matthew Bates. Attempt blocked. Clinton Morrison (Exeter City) left footed shot from the centre of the box is blocked. Attempt saved. Ryan Harley (Exeter City) right footed shot from outside the box is saved in the top centre of the goal. Michael Woods (Hartlepool United) is shown the yellow card for a bad foul. Attempt blocked. Scott Harrison (Hartlepool United) right footed shot from the centre of the box is blocked. Attempt missed. Alex Nicholls (Exeter City) right footed shot from outside the box is too high.